On iPhone and Android, you look for Spotify tracks by tapping the Search button, then the search bar, and then entering your query into the keypad. To view results by artist, album, or track, tap the appropriate tab. By default, track results are displayed first. 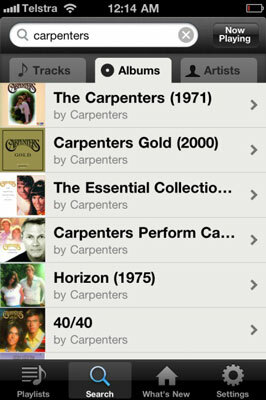 On the iPhone, small thumbnail images of the albums and artists (if available) appear, which is a nice touch. 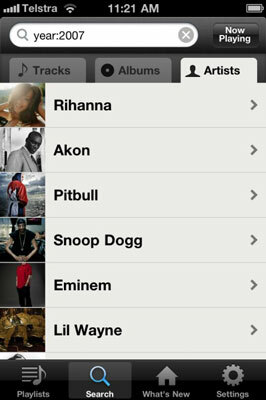 The advanced search techniques work in Spotify Mobile, too. When you type year:2007 into the Search text box on an iPhone, you come up with Rihanna as the top artist. Tap the Artists tab to see the most popular acts from that year. Advanced searches need to have the first letter of your query in lowercase, for some unknown reason. But on both iPhone and Android, nothing comes up if you use a capital letter. But if you use lowercase, everything works fine! Android users can control Spotify with the power of their own voices! Spotify is compatible with Google Voice Search (available as an app from the Android Market). After you have this app, instead of entering boring old text into Spotify’s search bar, tap the microphone icon next to it. Now, say the name of an artist, track, or whatever you want, and Spotify happily goes looking for those words. Pretty cool. Don’t take offense if it doesn’t recognize your accent, though!